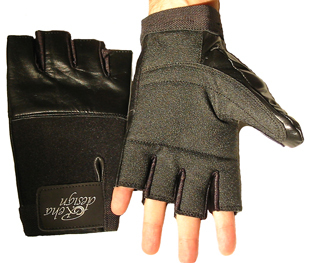 Are you looking for a strong leather wheelchair glove with a strong grip to match? Look no further than RehaDesign Ultra-Grrrip wheelchair gloves. Ultra-Grrrip wheelchair gloves feature a textured leather palm, which is as rough like sand paper to give wheelchair users a strong grip on the push-rim. 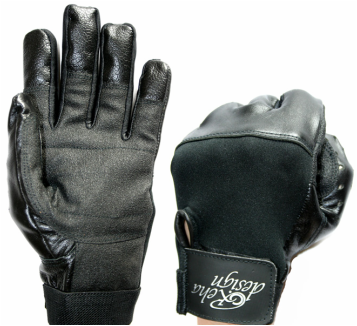 Unlike cheaper leather gloves, all Ultra-Grrrip gloves feature a lining so your hand never touches the leather. This means there is no need to pre-wash your gloves before using and no risk of getting a black hand when your hands get moist. Just like our half-fingered Ultra-Grrrip wheelchair glove, Ultra-Grrrip 4 Seasons full finger wheelchair gloves are sturdy leather gloves and feature a textured leather palm for improved grip on the wheelchair push rim. And don't worry, RehaDesign Ultra-Grrrip wheelchair gloves will never make your hands black the way cheaper leather gloves will. 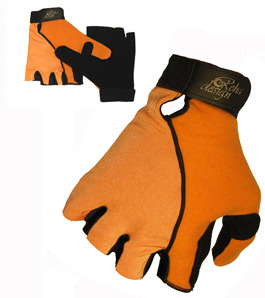 All Ultra-Grrrip wheelchair gloves are lined, so your hand does not comes in direct contact with the leather. Use 4 Seasons wheelchair gloves year round, in cold, wet, rainy or dry weather to protect your hands and improve your grip. Looking for comfort and design in a wheelchair glove? Consider RehaDesign Gel-Palm gloves. Gel-Palm Wheelchair gloves feature a terry backing to wipe the sweat away, plus a gel insert built into the palm for improved padding. And just like our Ultra-Grrrip wheelchair gloves you will find a textured palm for improved grip. And with this glove, we have thought about safety as well. Gel-Palm gloves now feature a reflective safety strip (not shown in photo) so that your moving hands will reflect light back to cars and help to make you more visible at night. Generally most sizes are available in either of two colors: Orange back and Black back, the palms are always black. Please tell us your color preference below. HOWEVER, we reserve the right to substitute the other color in case your color preference is not available. If you do NOT want us to substitute if your preferred color is unavailable, please contact us and send us a note and let us know.